If you have ever looked for a cat to adopt on Petfinder or the website of your local shelter, you may have noticed that a fair amount of them have been ear-tipped. If you don’t know what that is, when a stray or feral cat is captured and fixed, the vet will remove the tip of one ear or put a notch in one ear to show that the cat has already been fixed. Ear “tipping” or “notching” is usually done for the Trap, Neuter, Release (TNR) programs but sometimes a well-meaning person will trap a cat that is friendly to humans and not release it but put it up for adoption. I believe that is what happened to Frankie, although we know nothing about his history. We do know he has a notch in his ear indicating he was probably captured as a feral, perhaps at a young age. We know the history of Puck, who was a bottle-fed kitten. Puck will go outside if given the opportunity but he gets nervous easy and then wants to go back inside. I found Chris in the shelter when he was around five months old. I know he came from another shelter but I don’t know his history before that. I do know Chris loves going outside but he also stays close to home. Frankie is not like either one of them. He is constantly crying at the door to go out and, while he is not as good about slipping out the door as Chris is, he will get past me sometimes. When that happens, he immediately starts exploring the neighborhood. If I get close enough to catch him, he runs or he finds a car to hide under. When I put a harness on Frankie and walk him, he tends to travel in one direction. I know most cats have a territory that is smaller than the area that Frankie takes me through. I usually have to coax him to travel in a direction toward home instead of away. The last few outings I stayed out with him a long time to see if he would eventually make his way back home. He didn’t. I can’t help but wonder if he would ever want to come home if he escaped and I lost track of him. He might also travel too far and get lost. Frankie has too much of a wild cat in him and I wonder if he wouldn’t have been happier if he was allowed to stay outside in a TNR colony. Something happened Tuesday night that showed just how wild Frankie still is. We ordered take-out from a nearby Italian restaurant. 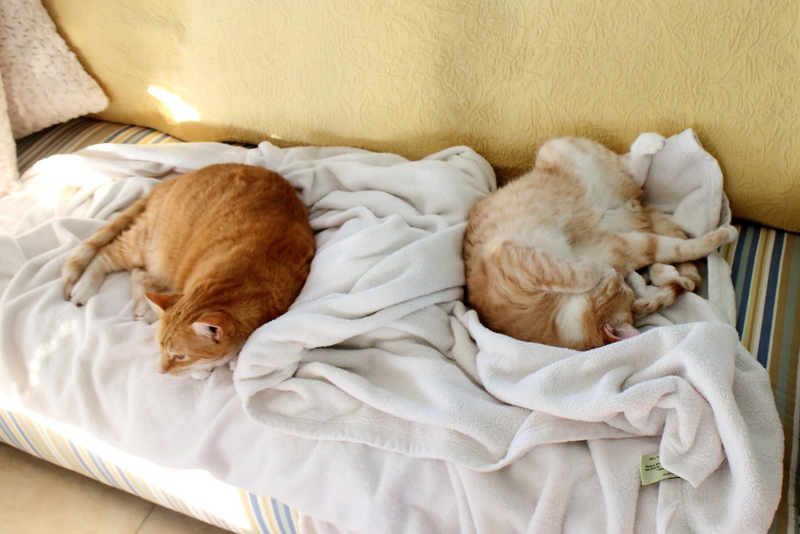 When the driver arrived, I shut the slider between the house and Florida room, locking the cats in the house and allowing me to open the door without worrying about Frankie or Chris running out. Unknown to me, Frankie was in the Florida room with me and ran outside when I opened the door. It was dark outside and I had no shoes on. Our grass is loaded with little stickers called sand spurs. They are painful to step on so I quickly paid the delivery driver and ran inside to get my shoes. When I got out, the driver had followed Frankie behind the house to our left and managed to herd him back toward me. Frankie ran right up to our door and I thought the driver scared him enough to want to go back inside but that was not the case. He continued around to the other side of our house and ran under Rose’s car. The two of us looked for him under the car but it was too dark so I pulled my little key-chain flashlight out of my pocket and looked under our vehicles. He was not there. That is when the driver noticed him near the front door of the house to our right. I tried to grab Frankie and get him to release his catch but he eluded me and ended up back under Rose’s car. The two of us worked at him from opposite sides of the car, at which point he let go of the bunny and crawled out from under the car. That was when I grabbed Frankie and picked him up while the driver grabbed the rabbit and checked out his injuries. He seemed uninjured except for a small gash on the back of his neck but he was having trouble breathing. The driver tried to stroke his neck to stimulate breathing but it was soon too late for the rabbit. After that incident, on Friday, Rose decided to take Frankie for a walk. I hurt my back Thanksgiving morning and was not up to the task so Rose decided that Frankie needed to get out more. She was out with him for a long time and when she returned she said “Never again!” Frankie managed to force his way out of the harness and led her on a chase around the neighborhood. Those incidents made me wonder whether Frankie’s cushy lifestyle in our home is really what’s best for him. Don’t worry. I’m not going to release Frankie into the wild. In fact, I am watching him now lying upside-down on a soft blanket on the sofa. He seems to enjoy the good life as much as the wild life but I can’t help wonder how many other cats have been “rescued” that may have been better off left alone. I also wonder how many cats were never adopted because a “wild” cat was adopted in their place. What do you think? Is it wrong to leave a feral outside even if it is friendly towards humans? 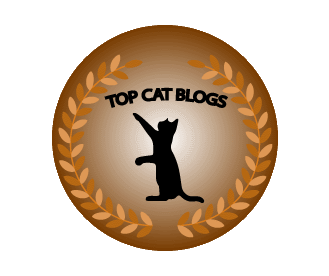 This entry was posted in Uncategorized and tagged adopt, Cats, Feral, TNR, wild on November 29, 2015 by Charles Huss. Interesting. Junior was trapped at 3 months old and mom sometimes wonders this. That being said, our rescue has adoptable cats that are ear tipped. We mass trap colonies and everyone gets surgery before we determine release. But we try to be careful about being sure they are truly ideal for adoption. I think some of these cats would love to be inside and outside cats. Our neighborhood doesn’t allow outside cats and our previous neighborhood was too close to traffic but if I had a farm or a house on a large piece of land, I would probably have a cat door to the outside. Very interesting question. They say truly feral cats can never be tamed. Maybe there is some truth to it. I think the longer they spend their lives outdoors as kittens, the truer it becomes in general, although every cat, like every human, is different. I have never thought about that. I prefer all cats to be inside if at all possible, but it never occurred to me that may not be what the cats wants. I know our Spooky was mainly outside for 13 years when our neighbor owned him. We make him stay inside now and he never tries to escape, but it could be because of his age. I think it is healthy for them to be outside but also dangerous. A back yard with a cat-proof fence would be ideal. Sam was adopted at such a young age by us and immediately harness trained that he’s never tried to “escape”…….he also learned through the years just where his yard is and is content now to just sit and do some minor exploring. He doesn’t run off and never has. 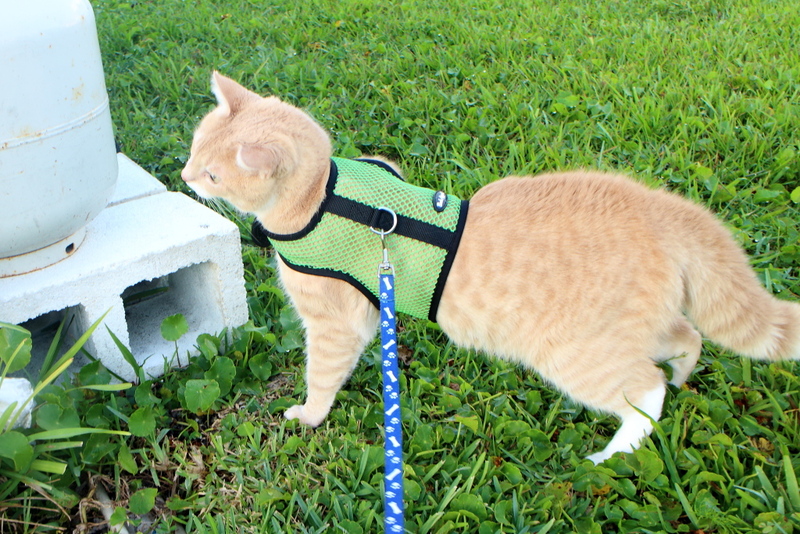 We put the harness/leash on only in the dark now……….during the day one of us is out with him BUT if he was a cat who would run when we wanted to bring him in we’d always harness him. Because he had the harness from the age of about 5-6 weeks, he actually STEPS into it now; he expects to wear it. Anyway, it’s a good question………I wish all cats could live the life they WANT to live but sadly that sometimes isn’t the most “healthy” or “safe” life for them. We want them to be safe……..it’s kind of a tough tightrope to walk! Chris loves to go outside but thankfully he is good about staying close to home like Sammy does. We used to let Chris and Puck out in the back yard while we watched at our other place and they were fine but when Frankie joined the family he ruined that by running away. To a point I agree with you but I think that Frankie in the long run is much, much better off than if he never lived with you. I had found my Angel Bobo outside when he was about 6 months old, I never knew his history. He ALWAYS tried to get out, ALWAYS,. I used to take him for walks, but being the paranoid person that I am I do not have ANY faith in ANY type of a harness at all. I find harnesses made for cats to be severely lacking. If I were to get a harness it would be for a small dog because I still believe that dog products are made of a much higher quality than cat products. When I would take Bobo out, he had a DOG COLLAR (yep, he did!) that he only wore when he went outside and I had a DOG LEASH that was a heavy chain. I didn’t (and still do not) as I said above, trust ANY type of a leash, collar or harness that is made specifically for cats. I am sure that living with you, with the security and love, you are giving Frankie a much better life than he could ever hope to have if he had remained outside. I know Frankie is better off with us but I’m not sure he knows it. I also understand your concerns. Our harness is actually made for dogs (It’s called Bark Appeal) and Frankie managed to get out of it. Being outside as a kitten is a factor but every cat is different. It’s true, some cats prefer the wild to staying indoors, and it sounds like Frankie is one of them. But I know he has a good life with you, and he seems pretty reckless when he is out. The cat before Sparkle, Harlot, was an indoor-outdoor cat – which is what SHE wanted, not my human. It was only on Harlot’s insistence that she was allowed outside as much as she wanted. My human worried about her every day, but Harlot was devoted to her and always stuck by home. She never went missing and if she chose to stay out all night (which was rare), my human knew she was nearby. I wish it was safe to do that with our cats but unfortunately it is not. We want to add a screened patio outside our side door as a buffer area. Maybe that will help. Years ago I read an article where they researched some outdoor cats by following their tracks in the snow. These cats had homes, but were the traditional “out at night” cats. They would be on the front porch at sunset and still on the porch the next morning. In the meantime, they had covered as much as 5 square miles. Wow. They were busy at night. Seems like you just can’t take the wild outta some cats. The opposite is true of Zoey. She spent the first 9 months or so of her like outside. We trapped her and brought her inside, and while she still has a wild streak, she has no interest whatsoever of going outside. Guess she remembers how hard it was living on her own out there. I guess Zoey decided she liked the good life better. Giving the cat the choice of inside or outside is ideal. A cat door to the outside would be great. Unfortunately, we do not live in a place where that is allowed and could result in us being forced to give up the cat. Also, there are a lot of rabbits around here and a cat killing them off could piss off the neighbors. Here is a post from a couple of years ago about our “wild” cat Frankie. He hasn’t changed much since then but I know he is happy that he has a home. I was going to comment on this, but I see that I did 2 years ago. I still feel the same, cats are safer inside even if they are not as happy as they would be outside. They sure are. Cars are a huge threat. That is why I keep Frankie on a leash and watch Chris. Frankie escaped once and hid under a neighbor’s car. That neighbor had a pitbull mix dog on a leash outside who would have attacked Frankie but his leash was too short.